Sometimes you may encounter the movie distortion problem especially after you set a new movie size. For example, you create a morph as below. Note that the movie size is square. If you create this morph for making a DVD, you now set the movie size to 720 x 480 (NTSC) or 720 x576 (PAL). As you see on the Preview window, the morph now looks squashed. How to avoid this ugly movie distortion caused by the unsuitable width to height ratio? It's so easy if you use FantaMorph Deluxe. 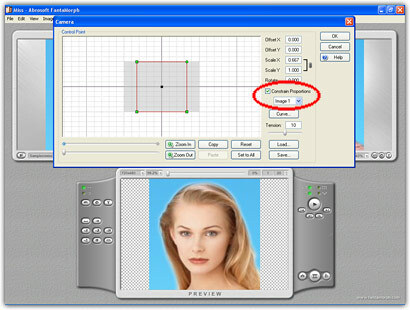 Just use the Camera tool to constrain the proportions to Image 1 and Image 2. Now the movie looks like below. If you don't like the blank area around the actual morph, you can use the Sequence or Movie Effect tool to decorate the movie. 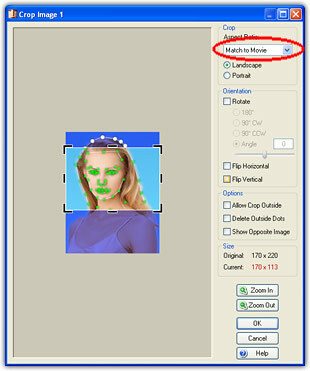 You can also use the Camera tool to change the size or position of the morph. Now the final movie looks like below. No movie distortion, and even more beautiful. There is another method to avoid movie distortion. You just need to set the Aspect Ratio to "Match to Movie" when crop each source image. Now the final movie looks like below.